Leon Henry is returning to Hemel Storm this season after a year playing for Solent Kestrels. Hemel Storm have added a further five exciting players to their ranks, a week after confirming the re-signing of skipper Bode Adeluola and four other squad members. Yesterday (Tuesday) Storm announced five squad moves, two of which will be familiar names for Storm fans. Will Ashby is a tenacious defender. Jack Burnell and Leon Henry are returning to the club, while Will Ashby, Leome Francis and Jamie Hayes are new faces. 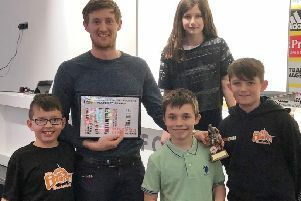 Fans’ favourite and popular junior coach Burnell is returning for a third season with the club after a hard summer of individual strength and skill training. The former England junior international is a product of Storm’s junior programme. A 6ft 4ins guard, he is considered to be among the best three-point marksmen in the league. Forward Jamie Hayes is joining Hemel from Essex Leopards. The 6ft 3ins lightening quick guard Henry is being welcomed back to Hemel after a season with last season’s Division One League runners-up Solent Kestrels. Henry, who has also played professionally in Iceland, is now fully recovered from a broken hand sustained half way through last season and the club believes he will fit perfectly into Storm’s up-tempo style of play. New man Ashby is a 6ft 1ins sharp-shooting guard and tenacious defender who has played professionally in Spain as well as briefly for the London Lions in the British Basketball League (BBL). He was on the National Basketball League (NBL) Division One Essex Leopards championship winning team of 2015 and was that club’s Most Valuable Player (MVP) following their successful campaign. Storm are hoping he will bring savvy and experience to his first season with the team. Francis is a powerful and versatile forward who is known for his athleticism and inside presence. This will be the 6ft 6ins player’s sixth season in the top flight of the NBL. He played for the Derby Trailblazers last season and has previously suited up for the Leicester Warriors. Storm expect him to be a handful for any opponent and will compliment Storm’s new new-look squad. Hayes is a 6ft 6ins forward who has consistently been one of the top rebounders in the country over the past three NBL seasons. He is joining Hemel from Essex Leopards and is noted for his all-out effort, a quality that Storm fans have always appreciated. The club hope he will add bite to their front-line. These new signings will join five other names who were confirmed last week. Guard and club captain Bode Adeluola, forward Michael Darlow and 6ft 9ins Tom Adorian are all returning from last season’s team. The 6ft 6ins forward and crowd favourite Darlow is now the club’s longest-serving player and is entering his eighth campaign with Storm. Meanwhile, Elliott Sentance and Blayne Freckleton are two other new additions. Sentance has an impressive international background, having represented England at under-16s and under-18s level before being selected for the Great Britain under-20s squad. The 6ft 5ins forward, who played college basketball in Canada, was at fellow Division One outfit Leicester Warriors last term. He will be another inside/outside threat for Storm and brings an all-round game to the line-up. Freckleton is an exciting 6ft 2ins guard who is known for making big plays. He joins Storm having played in the BBL and was a member of the 2016/17 Team Northumbria league and cup double-winning squad. He’s an accurate three-point shooter and is also dangerous when driving to the hoop. Storm expect to make further squad announcements over the coming weeks. Under head coach Robert Youngblood, last season saw Hemel win their first national silverware for six years when they hoisted the National Cup in January and they then went on to reach the league playoff final in April when they just came up short against Worthing Thunder. The new season re-starts on Saturday, September 8, with a pre-season friendly against a Team USA Select touring side. Their first competitive fixture then takes place on Saturday, September 22, in the National Trophy when Thames Valley Cavaliers visit Hemel Hempstead Leisure Centre.